Preliminary recovery (developed in our company) is quite effective against short, simple, dictionary, repetitive, keyboard, etc. passwords and consists of several mini-modules. You can turn on/off each mini-attack separately. Preliminary attack runs about 5-10 minutes or even faster. Attack against SSID names. Verify various combinations of the wireless network name. Dates attack. Checks passwords that were based on date. For example, 12031994. Simple dictionary attack. Fast check the password by verifying all words from a given wordlist. Attack on repeatables. Checking passwords as a repeatable sequence of a character. Eg. '1111111' or 'xxxxxxx'. Attack on simple character patterns, like '123456' or 'qwerty'. Keyboard attack looks for keyboard passwords and all possible combinations. Eg. 'qwer', 'qazwsx', 'asdzxc', etc. Complex keyboard attack is the same as the previous 2 attacks but checks compound keyboard patterns. Smart keyboard attack guesses complicated keyboard combinations. 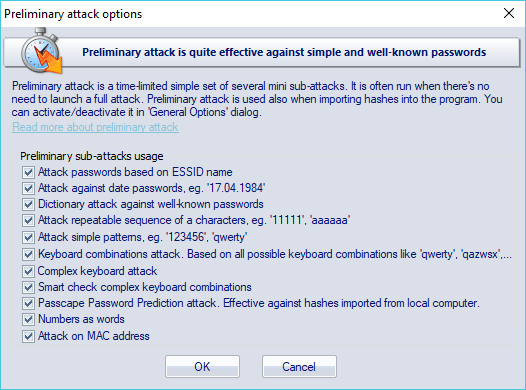 Passcape Password Prediction attack is the most complicated and state-of-art password prediction tool. Attack passwords based on numbers.